Category Dessert and tagged Paleo apple bars, paleo dessert, paleo sticky apple bars, sticky apple bars. This weekend has flown by. Saturday morning our crossfit had the usual Saturday morning class in our local park instead of at the gym. The workout used no equipment and was kid friendly so everyone brought the whole family. We had about 30 people show up and about 10 kids. My friend Janelle and I led the kids though their wod. It was a blast. They loved it. I've had a pretty tough week at the gym, and I'm really sore, so after the Crossfit Alexandria April in the park event all I wanted to do was relax. So I sat and watched the kids play outside for the rest of the afternoon. Janelle is my friend who ran the Boston Marathon this past Monday. Ever since she returned home Tuesday she's been on a cooking spree. She says that she can't sleep, so she's just cooking paleo instead. 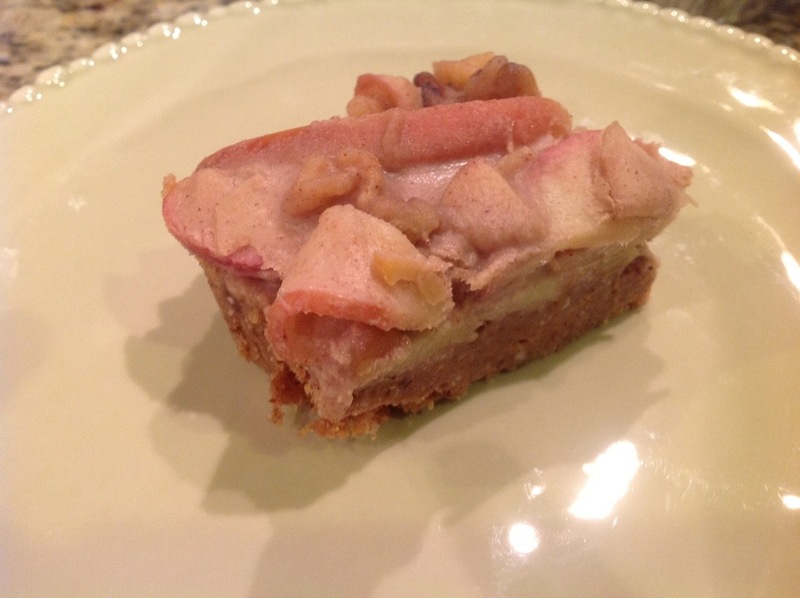 Well, I'm glad she's cooking because she brought me these no bake apple sticky bars that are unbelievable. The recipe comes from Paleomg, and everything from her blog is always a winner. So I can't take credit for making these, but I knew I had to share them because they were just so good. I'm even thinking about getting one now to go with my coffee. 1. Start by making the crust. Add all ingredients to a food processor and mix well. 3. Heat large skillet under medium heat. Add coconut oil and sliced apples. 6. Now pour apple mixture on top of crust and press flat. Put in fridge for 30-45 minutes to harden. This entry was posted in Dessert and tagged Paleo apple bars, paleo dessert, paleo sticky apple bars, sticky apple bars. Bookmark the permalink.